Heimdall is a Marvel character based off the mythological Norse god, Heimdallr. The primary Asir/Asgardian hero in the Marvel universe is Thor, who is generally Heimdall's friend. Heimdall is generally highly loyal to whomever has the throne of Asgard. He has battled Thor on a few occasions sticking to orders of Odin. 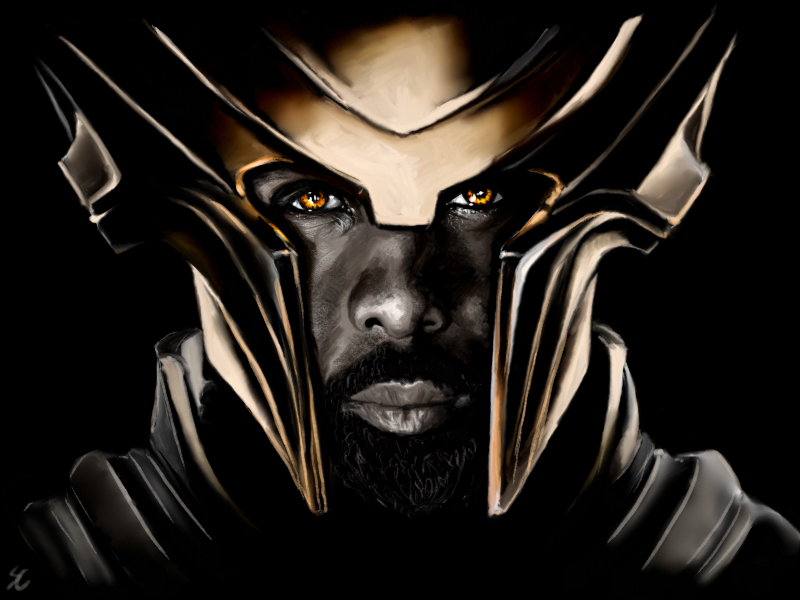 In the MCU Heimdall has been played by Idris Elba in the films, Thor, Thor 2, and Avengers: Age of Ultron. Heimdall is an Asgardian born of the nine mothers. He is the brother of the female Asgardian warrior, Sif. He is unusually strong and wise even for an Asgardian and is born with a special gift of heightened senses. His sense or hearing and sight are so strong that he can hear the sap moving the trees or a butterfly flap its wings many worlds away. He can see onto other worlds, and it has been suggested in certain stories through time itself. With his wisdom, steadfast loyalty and powers he is appointed to by Odin to guard the bifrost (rainbow bridge) that connects Asgard to other worlds. In function he is Asgard's chief guardian and its first line of defense. On a few occasions Heimdall has been put in charge of Asgard and given the magical God like powers called the Odin Force. On these occasions Heimdall is one of the most powerful characters in all the Marvel universe. To overcome Heimdall guard of the bifrost generally opposing forces have used magic, technology or in the case of Loki trickery. He has however been successful on most occasions of controlling the comings and goings on the bifrost bridge. A few characters such as hyper powered Absorbing Man, the Hulk, and Surtuur have managed to cross into Asgard by defeating Heimdall with brute strength. Amongst all the Asgard, Heimdall is considered to be one of the strongest, and most powerful along with Thor, and Odin himself. He has defeated Thor once in personal combat (However, Thor's powers were halved at the time). He also has personally battled the Hulk and Surtuur but was eventually overcome by both heavy weights. He is one of the wisest Asgardians having drunk from the well of Mimir like Odin. Being Asgardian he is far stronger, faster, and more durable than a normal human. He also ages much slower and can live for thousands of years. Heimdall is considered unusually strong even for an Asgardian putting him in the company of Odin and Thor. Martial skills - Considered roughly the equal of Thor and Odin. Heimdall's primary power is hyper senses that allow him to see and hear on other world's. These senses make him a formidable sentry. Gjallarhorn - The yelling a horn a horn capable of reaching out to all Asgardians regardless of there location in the world of Asgard to tell there is trouble. Heimdall is in the MCU films Thor, Thor 2 the Dark World, and Avengers Age of Ultron. He is played by Idris Elba. In Thor and Thor 2 Heimdall guards the Rainbrow bridge or the Bifrost bridge that connects Asgard to other worlds. He is depicted as being highly capable and loyal to Odin. At the end of Thor 2 Loki castes an illusion to make himself appear to be Odin. Not trusting Heimdall with the duty of the Bifrost and likely fearing his power he banishes Heimdall from his position. Heimdall has a new look in Thor Ragnarok. He does not appear in his gold armor but instead appears to be undercover. While no longer maintaining his post at the Bifrost he does come to help Asgardians fleeing the reign of Hela. He leads them to safety and protects who he can. At the end of Thor Ragnarok he and the surviving Asgardians leave on a space ship called the Statesman bound for Earth. In Avengers Infinity War the Statesman is attacked by Thanos and the Black Order. The Black Order begin to kill all aboard the vessel. With his final amount of energy Heimdall summons the bifrost and sends Hulk to Earth saving the Avenger. The rest of the Asgardians including Heimdall are believed to have killed with the exception of Thor who escapes.